Rosemary (Rosemarinus officinalis) doesn't look like mint, and it certainly doesn't taste like mint, but like many aromatic herbs, rosemary is a popular member in the scientifically classified mint family Lamiaceae. Other members of the Lamiaceae family include basil, sage, savory, marjoram, oregano, lavender, thyme and perilla. We can't go on about Rosemary, the herb, without a brief mention of Rosemary, the name. The name for Rosemary in Italian is 'Osmarini' and in Latin Rosemary means 'dew of the sea'. In English, Rosemary is a combination of Rose and Mary. Rosemary is a beautiful name, and moms are still naming their girls Rosemary, making it almost as popular as it was at its peak in the 1880s. 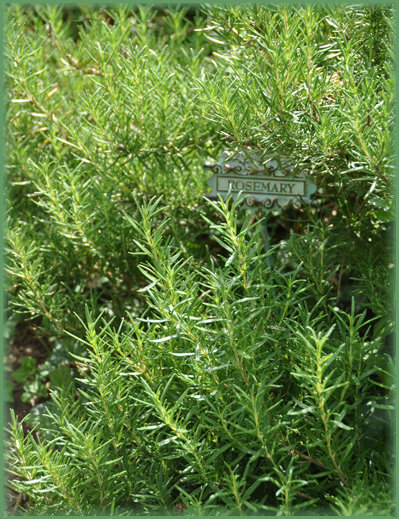 Rosemary was selected by the Herb Society of America (HSA) in 2000 as Herb of the Year. 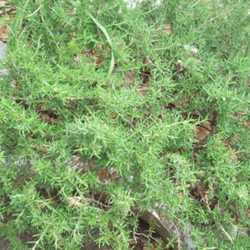 Hardy to zones 7a to 10b, aromatic R. officinalis is drought-tolerant and suitable for xeriscaping, preferring full sun and not to be overwatered. Depending on the cultivar, Rosemary can grow up to 5 feet tall. The fragrant plants produce blooms in shades of pale-to-dark lavender, blue, pink or white, and can be grown from seed or easily propagated by simple layering, or by softwood cuttings. Rosemary's gray-green foliage adds contrasting texture when planted as a border or accent along garden paths, in pots or directly planted in the garden. Here in our South Jersey zone 6b location we seem to be pushing the zone envelope. 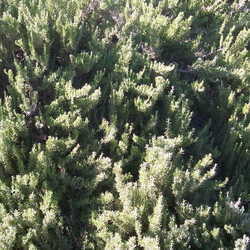 Many of our rosemary shrubs have overwintered in a Southern exposure for the past several years, much to our delight. In addition to being easy-to-grow, rosemary is also pest resistant. You do not have to apply pesticide sprays --which is best -- especially if you are planning on harvesting some for culinary use. To harvest rosemary, simply take in cuttings, rinse them off, group the sprigs into small bundles and tie with string to hang and air dry. In fact, I recently hung several bunches of fresh cut rosemary bundles using a bent, jumbo paper clip hanging from our kitchen pot rack. After several weeks, when the rosemary is good and dry, the needles will easily rub off onto a sheet pan, releasing a wonderful fragrance, as volatile oils permeate the air. 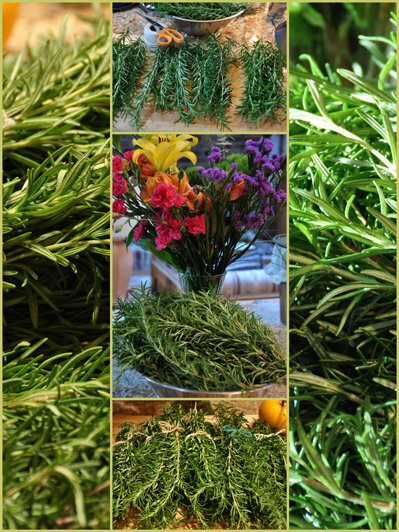 Maybe that is why Rosemary is known as the Herb of Remembrance: the fragrance is so unforgettable. Dried rosemary is best stored in spice jars or any airtight containers. Although now widely cultivated, Rosemary is native to Southwestern Europe (Spain, Portugal and France), Africa (Macaronesi), Algeria, Libya, Morocco and Tunisia Western Asia (Cyprus and Turkey), and Southeastern Europe including Sicily, Sardinia, and Greece. There are over 40 Rosemary cultivars. Some grow upright and tall, making them perfect for use in a border; others, like the gorgeous R. officinalis 'Bonnie Jean', creep low along the ground, looking lovely as they cascade over the edges of baskets or rock walls. Upright forms include R. officinalis 'Shady Acres'; a fast grower with good flavor, which was selected as a promising plant by the Herb Society of America. Other promising plant picks by HSA include 'Gorizia', a 4-foot tall shrub that blooms profusely, and 'ARP', which can reach 5 feet tall (1.5 m). And like most cultivars, the herbaceous leaves can be harvested. Using herbs in your foods adds nutrients as well as flavor. Rosemary as a seasoning to meals adds folate, dietary fiber, calcium, iron, potassium, manganese and other minerals, in addition to vitamins such as: vitamin A, vitamin B-6 and vitamin C. Rosemary's rich oil content contributes a small amount of saturated fatty acid. For example, 1 tablespoon (3.3g) of dried rosemary contains 0.2 g total saturated fat (1%DV). What is your favorite recipe using Rosemary? 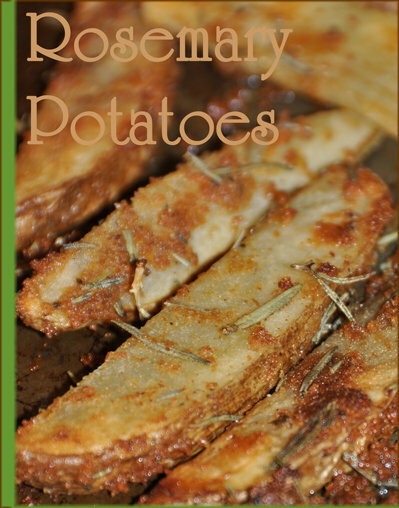 Rosemary oven-roasted Potato Fries tops the list as one of our family's favorites. Guaranteed, they will be a hit with your family and friends too. I never used cheese in my recipe, but was won over by my husband's recipe. I now make them with a pinch of hot pepper and a sprinkle of grated parmesan (Parmigiano-Reggiano, Grana Padano or Pecorino) to add flavor and calcium. Cheese takes the place of added salt, greatly reducing the sodium normally found in typical French Fries. These steak fries are a winner. Even with the cheese they have less than half the amount of calories and fat and 5 times less sodium than an equal serving of fast-food fries. You will need a large bowl to toss all the ingredients together, and a baking pan to spread the potatoes out. Cookie sheets work well. Wash and air dry the potatoes. Slice lengthwise into wedges 1/4 inch to 1 inch thick. Don't slice too thin or they will get too crispy and dry. Set aside. Mix together the oil, spices and cheese in a large bowl. We use a spoon to combine. Then add the potatoes and toss until evenly coated and seasoned. Spread the seasoned potatoes on a baking sheet in a single layer. Bake until browned, occasionally turning the potatoes with a spatula after the first 20 minutes. The cooking time will vary, usually ranging between 35 and 45 minutes. Serving size: 159g; Calories: 221. 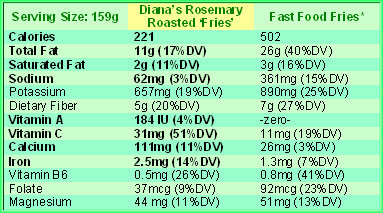 Rosemary Roasted Potato 'Fries' are an excellent source of Dietary Fiber, Vitamin C and Vitamin B6. They are a good source of Potassium, Calcium, Iron, Magnesium, and other minerals. See Table shown. Photographs: Thumbnail photo by Leo Michels - Source: http://www.imagines-plantarum.de/ Public domain image. All other photos ©2009 Wind. All rights reserved. * Nutrition Analysis by Diana Wind. Comparitive Nutrient Data of Fast Food Fries was calculated using public Nutrition Data for McDonald's French Fries, since they are well known worldwide. September is National Ovarian Cancer Awareness month. 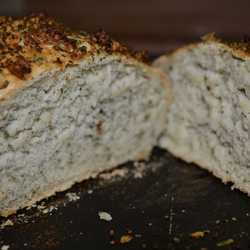 This recipe was linked to Diana's blog and submitted in the annual Blogger's O food contest to raise awareness in the fight against Ovarian cancer. Ovarian Cancer is the leading cause of death from gynecologic cancers in the United States and is the fifth leading cause of cancer death among U.S. women; a woman's lifetime risk of ovarian cancer is 1 in 67. Baby Names World, Meaning of Rosemary. Accessed 8/20/2009. Diana is a registered dietitian nutritionist with a passion for gardening and sustainable foods. She is a graduate of the Academy of Culinary Arts and member of the Academy of Nutrition and Dietetics. Food from the garden fuels her enthusiasm for eating right and nutritional science. She especially loves gardening as part of a healthy lifestyle. Gardening engages us with nature, gives us health benefits from exercise, and rewards us with fresh, nutritious foods. To assess your food and garden activity level, visit choosemyplate.gov or her blog. You can also follow Diana on Google.